Homeowners who sold during Q3 saw an average price gain of $40,658, the highest average price gain reported since Q3 in 2007. Single-family homes and condominiums sold for an average of $263,976 during the quarter, which is only a 0.2-percent increase over Q2 and 2.4-percent increase from the same period last year. Slightly more than 24 percent of all single-family home and condos sold during Q3 were purchased using FHA loans, RealtyTrac said. Homeowners are cashing out the home equity they have gained during the housing recovery, signaling that the housing market may be hitting a plateau, according to RealtyTrac’s U.S. Home Sales Report for the third quarter. 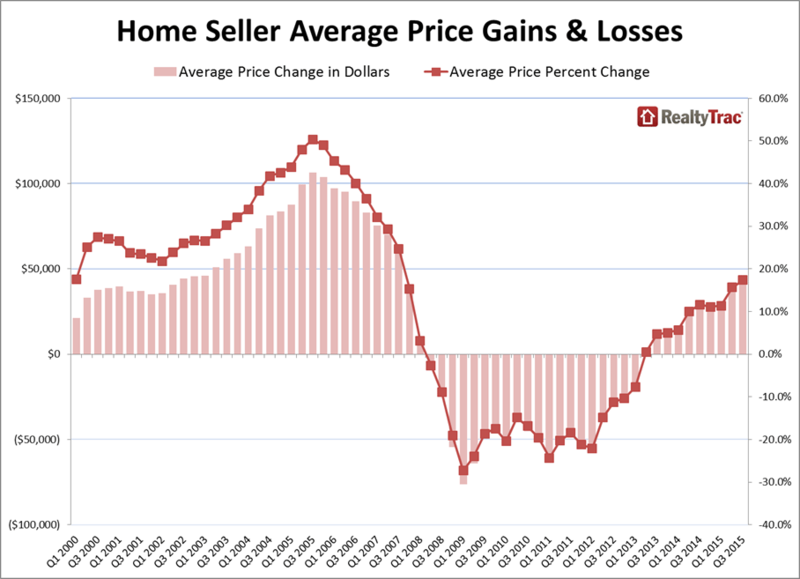 On average, homeowners who sold during Q3 saw an average price gain of $40,658, the highest average price gain reported since Q3 in 2007, shortly before the market crashed — despite the fact that home prices have been stagnant since bottoming out in 2012. According to RealtyTrac, single-family homes and condominiums sold for an average of $263,976 during the quarter, which is only a 0.2-percent increase over Q2 and 2.4-percent increase from the same period last year. Homeowners who sold their homes in Q3 owned their home for slightly under seven years, RealtyTrac said. Selling now is a smart idea because all signs point to a plateauing market, said Daren Blomquist, vice president at RealtyTrac. Homeowners who sold their homes in Q3 owned their home for slightly under 7 years. Slightly more than 24 percent of all single-family home and condos sold during Q3 were purchased using FHA loans, RealtyTrac said. That’s an increase from the 23.2 percent reported in Q2 and 17.9 percent reported in Q3 2014. Michael Mahon, president at HER Realtors, covering the Cincinnati, Dayton and Columbus markets in Ohio, said FHA loans accounted for nearly a third of all purchase transactions across his state. “Home sales in the third quarter saw an increase in first-time homebuyers in the area,” Mahon said.